You can ensure that your annual get together is a big hit as you countdown to the new year by including a great mix of songs to your playlist. There are many songs that are fun and festive and guaranteed to get your guests singing and dancing the night away. The Parting Glass: This anthem is typically played after Auld Lang Syne, officially ringing in the calendar change. It is among the most popular choices in Ireland and Scotland, as well as areas around the world with significant Irish or Scottish populations. New Year's Day - U2: Fans of Bono and U2 typically include this popular song among their all-time favorites. Guests who love Brit pop will be cheering for more. The Millennium Prayer - Cliff Richard: A big hit among the English, this is the Lord's Prayer set to Auld Lang Syne. This is very suiting for a party where the majority of those attending are Christian. It's the End of the World (I Feel Fine) - R.E.M. : Perhaps one of the best known R.E.M. tracks out there, It's the End of the World erupts with a catchy melody and lyrics that everyone will know within an instant. 1999 - Prince: Even though the year 1999 has come and gone, this is still one of the best songs of all time. Go ahead, party like it's 1999. Home for a Rest - Spirit of the West: The band's most popular single of all time, Home for a Rest is a breath of fresh Canadian air. New Year's parties usually involve a lot of drinking, so why not include a song about a little drinky-drinky. Celebration - Kool and the Gang: "Celebrate good times... come on!" This song inevitably leads to everyone getting on their feet, jumping up and down with joy. It doesn't get much more upbeat than this. Let's Get It Started - Black Eyed Peas: A more contemporary offering, the Black Eyed Peas "rock the casbah" with this upbeat ditty. Get The Party Started - Pink: This song is catchy and has a beat that will make everyone want to dance. Party Rock Anthem - LMFAO: Who won't have fun dancing to this upbeat tune all night long? The catchy lyrics will have guests moving their feet and jumping around. Easily the best known New Year's song of them all, Auld Lang Syne is always played the moment the clock strikes twelve. This song is actually a Scottish poem written by Robert Burns in 1788 and set to folk music. It's basic message is to remember long-standing friendships and the good old days of the past. This song is not only appropriate for New Year's but on other occasions such as graduations and funerals. 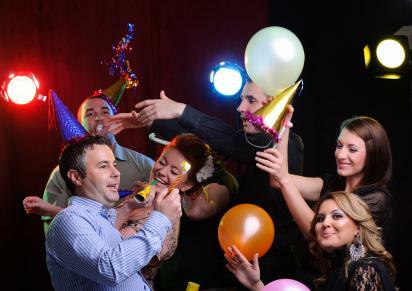 No New Year's party is complete without a great mix of songs to help your celebrate. Be sure to include both classic favorites as well as some new beats to your playlist so that there is a little something for everyone to enjoy.